Last smidgen of Hot Spinach-Artichoke Dip can be enjoyed with a cracker or dropped by spoonfuls into a bowl of hot tomato soup. 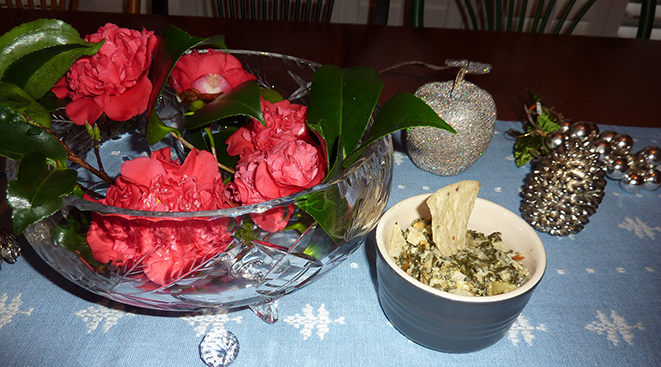 Our mild December brought my first camellia blooms to our holiday table and also allowed me to add a few greens from our flowerpot garden on the outdoor deck to our favorite recipe for spinach dip. On the New Year’s table in a cut crystal bowl were ruffly ‘Professor Sargent’ camellia blossoms. On the food bar was a casserole filled with bubbling Hot Artichoke-Spinach Dip, which we served with sturdy crackers and chips. The camellias lasted for several days. The dip didn’t. I usually heat up the last smidgen and drop spoonfuls of it into hot tomato soup or enjoy the last bite with one more cracker before cleaning the dish. The first time I tasted Hot Artichoke-Spinach Dip was at a Houston’s restaurant in Marietta, GA. Now, you find the popular dip on menus everywhere. My version is easy-to-put together and reheats well in a microwave. It’s also a flexible recipe allowing the cook to add extra seasonal ingredients. My garden’s addition to the dip for New Year’s was a handful of shredded Swiss chard, sliver-cut baby collards and a couple of tablespoons of chopped fresh parsley. Serves 8 to 10. Recipe is from “Making Memories” published by The Advocate newspaper in October, 1993. Thaw spinach and drain well; set aside. Cook onions in butter until softened. Add spinach, artichoke hearts, garlic, cream cheese, Monterey Jack and Swiss cheese. Add Worcestershire sauce, Tabasco sauce, thyme and Cajun seasoning to taste. Mix thoroughly. Place in greased two-quart casserole and cover. Let set several hours or overnight in the refrigerator. Remove cover and bake uncovered at 350 degrees for 20 to 30 minutes; top with Parmesan cheese and broil until slightly browned. Serve with chips, crackers, salsa and sour cream, if desired. Can also be served as a vegetable side dish. Testing note: If you have fresh parsley, Swiss chard, baby collards, or other seasonal greens, you can add these to the dip. Chop finely and sauté in the melted butter along with the onions. I usually double the amount of butter to 4 tablespoons total if I add extra greens. Leftovers should be refrigerated and can be reheated in a microwave.